Last week, I discussed attempts by both Gov. Gage and the Massachusetts militia to grab as much arms and ammunition as they could get. Gage quickly realized that the problem was not just a few radicals in Boston. The entire colony would resist the government and the military. Gage barricaded himself in Boston and sent word to Lord Dartmouth in London that he was going to need many more soldiers if they wanted to retake the colony. Gage put a battery of cannon on Boston Neck to prevent any invasion by land, and put naval vessels in place to prevent anyone moving in or out of the town by water. By September, 1774, the colonial government controlled only Boston. The Governor completely lost control of the rest of the colony. Gage accepted this fact and seemed content to remain in Boston until he could begin a new campaign in the spring. He sent several letters to Dartmouth in London calling for reinforcements of at least 20,000. As Gage put it: “A large force will terrify, and engage many to join you, a middling one will encourage Resistance and gain no Friends.” Gage wanted overwhelming force. Otherwise, you would just be poking a bear with a stick. Until he could get sufficient reinforcements, presumably some time in the spring of 1775, he would sit tight and remain on the defensive. Gage brought in some reinforcements on his own that fall, transferring regiments from Quebec, Newfoundland, and New York to Boston. Even after the reinforcements arrived in October, his force totalled only around 3000 men. He divided his force into three brigades, one under Gen. Hugh Percy, a second under Gen. Robert Pigot, and a third under Lt. Col. Valentine Jones (who received a brevet commission as General). His troops continued to drill and prepare, but went into winter quarters. Gage focused his immediate attention on gathering intelligence and preparing for a spring campaign. With only one or two exceptions, the army would remain inside Boston until spring. In order to fill the power vacuum, Suffolk County, which includes Boston and the surrounding area, held a meeting. Top patriot leaders Thomas Cushing, Samuel and John Adams, and Robert Treat Paine had left in August for the Continental Congress in Philadelphia. 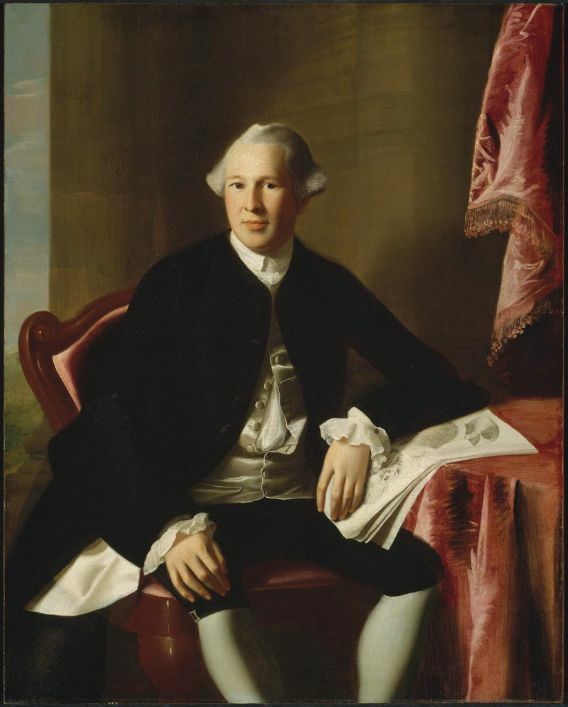 Dr. Joseph Warren of Boston led the meeting. Even without the top leaders, momentum for resistance and rebellion grew among the population. 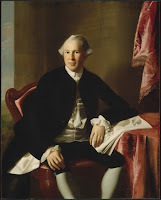 Before we dive into the Resolves themselves, I want to say a few words about Joseph Warren. I’ve mentioned him in a few episodes now, but have not given him much of a background. Warren was a medical doctor in Boston. He was a native born to Massachusetts and a graduate of Harvard college. Although he was only in his early 30's in 1774, he had been active in the Patriot movement for quite some time. In the 1760’s he had become an early leader in the Patriot cause, working for the Sons of Liberty with Hancock and the Adamses during the Stamp Act protests and beyond. He conducted the autopsy on Christopher Seidens, the boy killed just before the Boston Massacre. He also assisted with the Committee report on the Boston Massacre. He delivered two public orations for the anniversary commemorations of the Boston Massacre. For years he served on Committees of Correspondence and Safety for the Patriots, and wrote numerous newspaper articles furthering the Patriot cause. By late 1774 he was one of Samuel Adams’ top lieutenants in the resistance, which is why he took command when Adams and the other top leaders left for the Continental Congress. I think it is telling that Adams left Warren in charge rather than John Hancock. Hancock had, at times behaved with a little too much moderation. Some might call it timidity. Warren, on the other hand, had always shown his commitment to the Patriot cause. As a well respected Patriot leader, Warren was more than ready to lead the meeting that approved his Resolves. Warren had begun working on the resolves even before the Powder Alarm set everyone on edge on September 1. The week before, Committees of Correspondence had met in Faneuil Hall in Boston met to discuss their opposition and urged closing all the courts rather than operating under the Coercive Acts. Suffolk County was not the only county to draft similar resolves regarding their actions. But since the Suffolk Resolves went to the Continental Congress for approval, they tend to get the most attention. 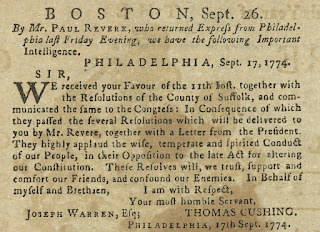 The other resolves make clear though, that the radical sentiments expressed were not unique to Boston. The general populous or at least a significant percentage of it, throughout the colony felt the same way. Initial meetings to prepare the Suffolk Resolves took place in private homes in Milton and Dedham. Warren introduced them on September 6 to a Convention meeting of Committees of Correspondence. After a few days of editing and discussion, the Committees approved them. 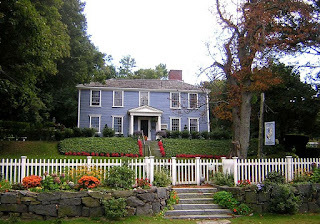 On September 9, the Convention met at the Woodward Tavern in Dedham. There, the convention gave unanimous approval to the 19 resolves. If you have never read the Suffolk resolves, I recommend doing so. They are only three or four pages long, and spell out a radical patriot view that makes the road to independence seem almost inevitable. I thought about reading the full text here, but decided it would be better to discuss it in my own words. Coming right on the heels of the Powder Alarm, when colonists were literally taking up arms to challenge the regular army, the Resolves capture the hostile sentiment of the people. The preamble proclaims that their ancestors had fled the persecution of Great Britain, which now sought to use its power and vengeance against the colonists. Their ancestors had sacrificed and toiled to build the free and just society that they now enjoyed. Now, the British sought to destroy all that by asserting full sovereign power over the colony and reducing its people to a state of slavery. The colonists’ only choice was to submit to slavery or resist. Clearly they favored the latter. The first resolve starts off on a conciliatory note. It recognizes King George III as their rightful sovereign. The colonists proclaim their continued allegiance. Up until the Declaration of Independence in 1776, almost all colonial documents stressed their loyalty to the King. Many of them held that the King would support their rights. He just needed to stand up to Parliament and assert his authority. It is unclear whether colonists were truly ignorant of the fact that the King wholeheartedly supported, and even encouraged, Lord North’s colonial policies, or whether they simply chose to pretend ignorance, in order to give the King an opportunity to change policies and appoint a new ministry once he realized that North’s policy of coercion would not work. The second resolve proclaims their duty to fight for the rights and liberties established by their forefathers. They recognized that they only have the rights they have because their ancestors fought for them. This generation had to continue that fight to keep the freedoms for their descendants. The third and fourth resolves criticize the Parliament for closing Boston Harbor, altering the colonial charter, and allowing criminals to be removed for trial elsewhere. They proclaim that they will not obey such laws. These resolves specifically focus on the Coercive Acts passed a few months earlier as the cause of the current crisis. There is no mention of taxes or the longer term fights over trade rules. Those are still a problem, but they are not why the people object to the colonial government. It is the laws Parliament created to compel obedience that are causing the current disobedience. The fifth and sixth resolves focus on the appointment of judges. Because such appointments violate their colonial charter, as it existed before the Coercive Acts, the people should ignore any court orders from judges acting under these unconstitutional laws. It calls on sheriffs, jurors, and others to ignore the courts and refuse to obey them. In the absence of a working court system, it calls on colonists to try to resolve disputes or submit to arbitration. Anyone using the colonial courts going forward, will be deemed to be collaborating with the enemy. The seventh resolve calls on tax collectors and other local officials not to send any taxes to the illegitimate colonial government. Rather, they should hold all money until a proposed Provincial Congress could be established. While London paid the salaries of a few colonial officials, most of the money needed to run the local government came from local taxes. These had never been a matter of contention. Colonists had always paid taxes authorized by the elected colonial legislature to support the government. Now, Parliament’s changes to the Charter rendered the whole colonial government illegitimate. Another resolve we’ll get to in a minute, discusses the creation of a new Provincial Congress to run things. In the meantime, we are not going to hand over our money to the illegitimate government when the new government is going to need it. The eighth resolve calls on those colonists who have accepted seats on the Governor’s Council to resign. Most appointees had done so already. The resolve tells the hold outs that if they do not do so by September 20th, less than two weeks away, they will be considered enemies of this country. Again, the colonial government appointed under the Coercive Acts is illegitimate. No more time for compromise. It’s time to pick a side. If you work for the colonial government, you are an enemy of the people. The ninth resolve criticizes the fortifications the army is building on Boston Neck. They fear it might cause people to think the army has some hostile intention against them. The resolve also attacks Gov. Gates for removing powder from the Charleston powder magazine and also his decision to prohibit Boston authorities from returning powder to private owners. Hey guys, we’re all friends here. Why are you acting so hostile? I’ve got to think Gage laughed when he read this one. The people are planning an armed revolt and they are going to be upset that the army wants to defend itself and not hand over guns and ammunition to be used against them, really? The tenth resolve attacks the Quebec Act. It accuses Parliament of establishing Catholicism and French laws. They see this as a danger to Protestants and to the whole continent’s rights and liberties as free Englishmen. Colonists had fought multiple wars over the last century trying to push the Canadian French Catholics back, at great cost of both lives and money. The Canadians had repeatedly invaded their borders and stirred up Indian tribes against them. This was an age old war between two distinct civilizations. Finally, with the end of the French and Indian War, the English had won. The French were out of Canada and the the English were in control. Now after they had WON, Parliament was giving the French everything they had ever wanted. French speaking colonists with their Catholic religion and French laws, which did not include an elected legislature, would now push against the borders of the English colonies, all under the authority of the British Government. What the heck! The eleventh resolve calls for a complete restructuring of the colonial militia. It recommends taking away commissions from all current militia officers. Each local militia should elect new officers based on both competence and whether they are willing to support colonial rights. It also calls on the new militia to prepare for war and to drill at least weekly. In the past, militias tended to be casual affairs. They would meet about four times a year for one day of drill. Most drill days tended to be an excuse for a town wide party, where everyone came with families, watched the militia parade, and had a picnic. Now was time to get serious and prepare for war. I guess fearing the eleventh resolve might be taken as an act of treason, preparing for war against the government, the twelfth resolve, reiterates their affection for the King and promises to use the militia only defensively to protect themselves. We just want to be ready just in case. Really, we are not planning to attack the army. It didn’t really matter. Within days of receiving the document the British Attorney General declared the Resolves to be treasonous. The thirteenth resolve addresses the fear that officials are planning to arrest the leaders of any resistance. If that happens, the people resolve to take hostages of any official working for the colonial government and to hold them until any prisoners are released. This was a real concern. In fact, Lord North would soon order Gage to arrest the ringleaders and ship them back to London. Gage, however, understood by now that arresting a few leaders would do nothing. The rebellious attitudes were embedded throughout the colony. Arresting a few leaders would not stop anything, but would almost certainly inflame more acts of violence. Still, the colonists were putting the government on notice that they would not tolerate any arrests and would take their own prisoners if Gage imprisoned anyone. The fourteenth resolves calls for a complete end to all trade with Britain, Ireland and the West Indies, and an agreement to abstain from the consumption of all British merchandise and manufactures, including anything from the East Indies, that is anything the the East India Company controls. This reiterated essentially the same thing the Boston Town Meeting had called for when word of the Port Act first reached the colonies, the so-called Solemn League and Covenant. It was the main issue under debate at the Continental Congress. Economic boycotts had worked before. It was the best way to challenge Britain absent military rebellion. The fifteenth resolve calls for the creation of a committee to consider the best ways to promote local arts and manufacturing, presumably to take the place of goods manufactured in Britain. If a complete boycott was going to work, colonies would have to do more for themselves. As much as Parliament wanted to keep the colonies dependent on Britain, the colonists now fought to make sure they could operate economically independent of Britain. The sixteenth resolves calls for the creation of a Provincial Congress to take the place of the colonial government. Specifically, it calls on all the local towns to select members to attend such a Congress in Concord on the second Tuesday of October. A call for a Provincial Congress really was an act of independence. Massachusetts would create its own government without any involvement from London. Even under the new laws, it still had an elected legislature in the colonial government. But that legislature’s power was so limited and under the thumb of the appointed governor and council that it could not act as a voice of the people. This new Congress, would act on its own authority and do whatever it liked. The seventeenth resolve pays respect to the Continental Congress meeting in Philadelphia. The resolve promises to “pay all due respect and submission” to anything the Congress recommends to the colonies to reestablish their rights and restore harmony between Britain and its colonies. Even the most radical leader in Massachusetts realized that an all out war between Britain and Massachusetts would not go well for the colony. Even while they created a new government and prepared for war, they hoped that the moderates would find a way to convince Britain to back down and compromise. At the very least, Massachusetts needed the other colonies to join with them in resistance. Going it alone was not an option. Therefore, they hoped the Continental Congress could find a political solution. The eighteenth resolve calls on the people to respect private property during this time when government is effectively absent. It calls on the people to avoid riots or any other attacks on people or property. They want to impress on the outside world that this is not a lawless mob, but rather a free people worthy of keeping their rights and liberties. If the colony fell into anarchy, it would only hurt any support for their cause. The nineteenth and final resolve calls for the creation of a committee or select individuals in each town to serve a dispatch riders. Should the army attempt to launch any sort of attack, the dispatch riders would seek assistance from neighboring towns and alert the countryside to any attack. It seemed inevitable that sooner or later, the British Army in Boston would once again venture out to threaten some other part of the colony. Without a standing army to oppose them, communication between all the local militia had to get the word out on a moment’s notice. Once complete, the County Convention published the resolves. The Massachusetts Gazette printed a special supplement on September 16 for distribution all over the colony. 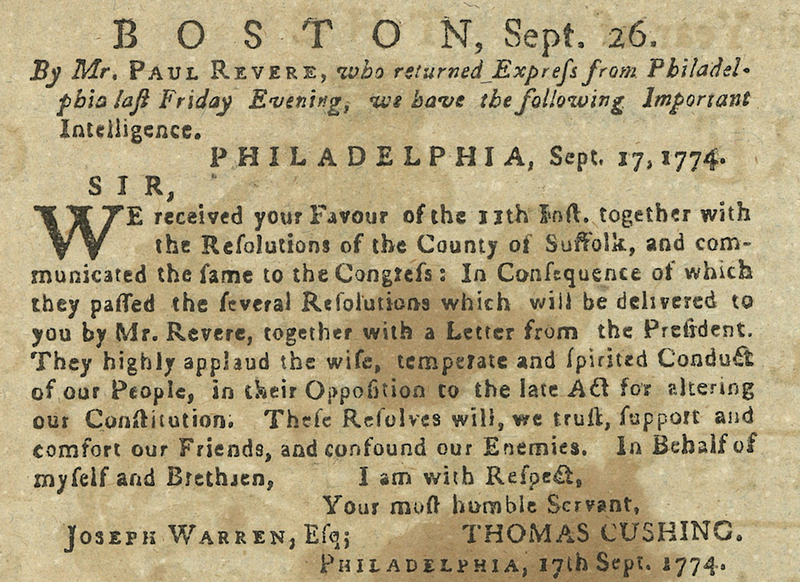 Paul Revere carried a copy of the Resolves to the Continental Congress in Philadelphia. Next week, we will take a look at how Congress responds to these resolves. Scaife, Lauriston Milton and the Suffolk Resolves, by Lauriston Scaife, Boston: Thomas Todd Co. 1921. Warren, Joseph An oration delivered March 5th, 1772: at the request of the inhabitants of the town of Boston; to commemorate the bloody tragedy of the fifth of March, 1770, Boston: Edes & Gill, 1772.